Underground infrastructure projects at airports will be easier for precast concrete producers to bid after release of the Federal Aviation Administration’s Approved Advisory Circular Specifications for 2019. 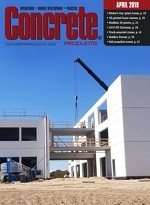 The 717-page document specifies precast concrete for all underground drainage structures for the first time, and stems from three years of FAA and National Precast Concrete Association collaboration. A developer of market-specific tools for fleet operators and drivers bound by Federal Motor Carrier Safety Administration hours of service rules cites the first electronic logging device programmed with functionality to reflect the agency’s HOS rule exemptions for mixer and concrete pump drivers. GeoSpace Labs timed the February release of its construction-specific ELD with FMCSA’s formal announcement of exemptions for concrete delivery and placement vehicles; it waives drivers’ 30-minute break requirement and relaxes the reset period from 14 to 12 hours. Contractors Allan Myers and J.D. Eckman Inc. prevailed in Commonwealth Court of Pennsylvania last month in a challenge to Pennsylvania Department of Transportation’s project labor agreement mandate for a Montgomery County street reconstruction. Tried in the Commonwealth Court of Pennsylvania, the court ruled that the mandate violates competitive bidding laws and discriminates against nonunion contractors—in a state where less than a quarter of the construction workforce is unionized. COUNCIL HAMMERS BUILDING SAFETY MONTH THEME: “NO CODE. NO CONFIDENCE."